In this 2018 school year, many of Skyline’s athletes uphold a tradition of excellence. Fortunately for the fans and players, Skyline’s Men’s Basketball possesses the same characteristics. Practicing everyday and working hard, they have progressed, gathering a number of hard earned wins. While they have had some setbacks, the team is working to improve their shooting technique through their intense practice and focus. While the team routinely works on layups and jump shots, they prioritize three pointers as the focal point of their shooting. It is reported that Skyline’s team is above average in the accuracy of their shooting shenanigans; although this may indicate ball security concerns, they fight back with killer shooting accuracy. The team is continuously working on fitness. One of the team’s players, John Kapos, addressed it in a nonchalant manner, saying, “yeah, we run A LOT”. 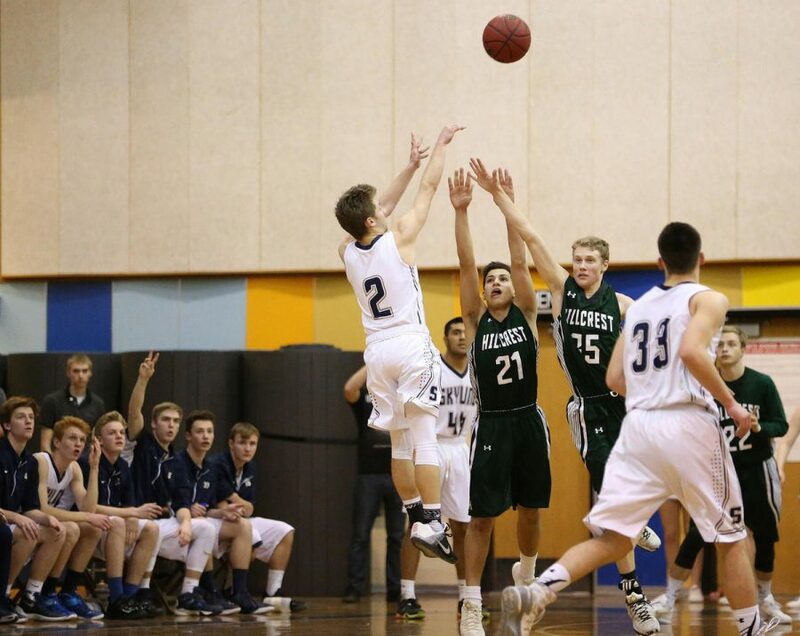 Other aspects of the game that Skyline excels at include the “fast break” in order to set up “easy baskets”. When asked how he predicted Men’s Basketball would do this season, Kapos confidently said, “We’ll be good” which is certainly a positive and reassuring response for the team’s future, giving hope to everyone involved. The team has not been working on a full court press (playing defense from the opposing team’s inbound pass). However, they plan to do it at some point in upcoming games; it may be successful in the task of tiring out their competition. On a separate note, Kapos finds that the taller opposing teams can, dauntingly, use their stature as an advantage against Skyline’s players. In addition, he feels that Skyline needs to work on their shooting skills. Fortunately, the team is working on their three pointers and other weak spots during their sweat inducing practices. Other, more controllable factors, such as foul shooting percentages are a strong point for Skyline. As Kapos puts it, Skyline’s percentages are overall satisfactory. As is previously stated, the Men’s Basketball team is improving and seeing success through their hard work and perseverance. Fans, players, and coaches can look forward to improvements in the remaining season of Skyline Men’s Basketball.